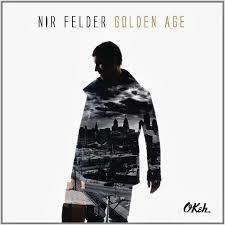 Expectations may be high for Nir Felder’s Golden Age. The guitarist was named the “next big jazz guitarist” by NPR a few years back and this album has been a while in the making. Joining Felder is a young rhythm section of the absolute highest quality: pianist Aaron Parks, bassist Matt Penman and drummer Nate Smith. How did the next big thing do? I found the album hampered a little bit by its own aesthetic constraints, but it certainly has its moments and bodes well for the future. Golden Age suffers from album-as-performance-art syndrome, exploring the concept of a ‘golden age’. I have no problem with concept albums, but telling a coherent story is harder in music without vocals and the tactic Felder has utilized, spoken word collage taken from various speeches made by political and cultural figures, still seems like a gimmick to me. It also requires a great deal of balancing between the band and the speech samples, lest one get lost while the audience focuses on the other. The first track, “Lights”, puts the focus clearly on the speech. It is really an indie-rock instrumental under the speech samples, with no or little improvisation and intentionally subdued playing from the virtuosic band members. Certainly there is improvisation to be had here, listen to drummer Smith let loose on “Memorial” or Felder himself fly about in “Ernest/Protector”, but much of the album reads as through-composed rock riff type instrumentals. It sounds to me almost like the indie rock band take on Pat Metheny compositions. While it certainly finds its niche, and Felder does demonstrate some real chops, I find it hard to get excited by the album. The first track of drummer Matt Wilson’s recent album Gathering Call sets the tone for what follows in spirit, if not always in tone. It is a bubbly hard bop romp called ‘Main Stem’ and it is infectiously, almost excessively, happy. At two minutes forty five seconds, it doesn’t quite have the time to fit in long form explorations from the front line of cornet player Kirk Knuffke or saxophonist Jeff Lederer, bassist Chris Lightcap, or from the album’s special guest John Medeski on piano, but it delivers a tight, festive jaunt through the band and suggests that everyone was in a good mood. That mood seems to last through the album, despite how diverse the music actually is. From the free jazz blowing of the second track, “Some Assembly Required” to the somewhat contemplative “Hope (for the cause)”, to their take on Charlie Rouse’s aptly titled blues “Pumpkin’s Delight”, everyone is clearly in a good mood. High spirits and quality musicianship easily sustain the album, although I do find myself wishing occasionally that they had given themselves a bit more room to move around. Of the thirteen tracks, six are less than four minutes long. When they do open up, as on the aforementioned “Pumpkin’s Delight” the results are exciting. A bit unlike my usual fare here, Give the People What They Want is not a jazz album, but a throwback soul celebration from the fabulous and charismatic Sharon Jones and the Dap-Kings. The album opens with the one-two punch of “Retreat”, a horn powered burner followed immediately by the Motown groove of “Stranger to My Happiness”. These two opening songs are worth the price of admission by themselves; they are exciting and infectious, frequently leading me to get up and dance like a total fool. The album doesn’t end there, but blesses us with another eight tracks. Give the People What They Want’s production and release was delayed after Jones’ diagnosis with cancer. Luckily she had a successful treatment and recovery and is back in fine form with what I can only hope is only the next in a long line of albums to come.